"The Final Salute " statue commemorates the Australian test cricketer, test captain and cricket administrator, Sir Donald Bradman who grew up in Bowral. The bronze statue was unveiled on the first anniversary of Sir Donald Bradman's death by his former Test batting partner Bill Brown on 25 February, 2002. The statue captures his iconic pose, the raising of the 'baggy green' as he leaves the field for the last time. Sir Donald George Bradman, AC (27 August 1908 – 25 February 2001), often referred to as "The Don", was an Australian cricketer, widely acknowledged as the greatest batsman of all time. Bradman's career Test batting average of 99.94 is often cited as statistically the greatest achievement by any sportsman in any major sport. Donald George Bradman was born on 27 August 1908. He grew up in Bowral and became the greatest cricketer of all time. In 52 Test matches Bradman scored 6996 runs at an average of 99.94. Sir Donald Bradman died peacefully at the age of 92 on 25 February 2001. 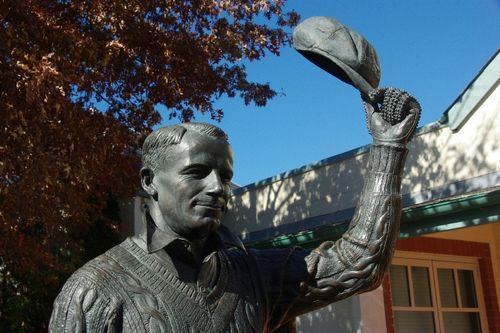 "Future generations all regard him not only as a very great batsman, but also as a brilliant captain and, above all, as one of the truest gentlemen who has ever worn flannels"
This statue was unveiled by former Australian cricketer and Bradman team mate, Mr Bill Brown, 24 February 2002.